For today's review, we are heading to Bowcraft Playland to check out what may not be a huge coaster, but it's huge for this park. Crossbow. The best way for me to describe it would be to call it a giant roller skater on steroids. So, yeah. It's not insane or anything, but it's a fun ride. This should be enjoyable. So we get in the seats (really comfortable and high off the ground for a sitdown family coaster BTW), pull down the lap bar, and we're off. 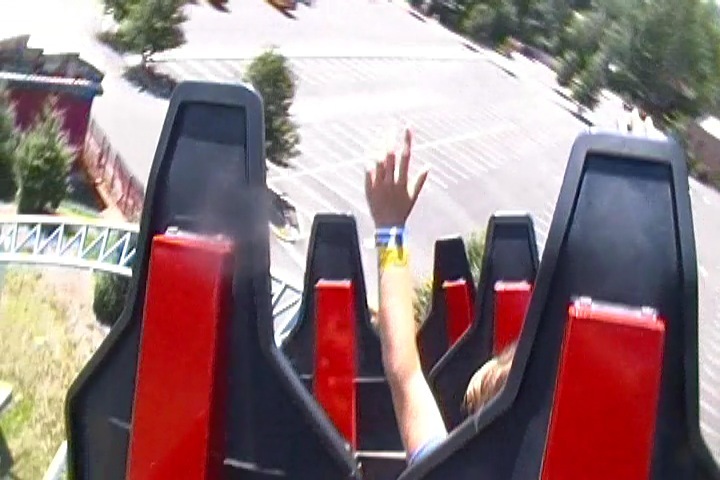 We roll around a turn, head up the lift hill. It's not a very big lift hill, but this isn't a very big park. It's in New Jersey, so let's not even pretend that it's possible for this coaster to have a good view. Anyways, we reach the top, and drop on down. WEE!!!! It's a nice curved drop, and...yeah. That's all I have to say about that. It's fun. We then get some laterals as we head up into a helix. Now don't get me wrong. There's nothing special or great about this helix. It just proves that it is not in fact forceless. After we helix on up, time to do it in reverse and helix on down to the ground. WEE!!!! Once we're down, we snake around and go through a couple banked turns. WEE!!! More fun!!!! And there's the brake run. Yeah. That's it. There's really not much to this ride. But for being a credit whoring coaster in a sh*thole in New Jersey, it's not a bad ride. If you're at Bowcraft Playland, I don't need to tell you to ride it because you would not be at the park if you weren't there to ride Crossbow. So...enjoy. It's a fun little ride. Here's a POV of Crossbow.